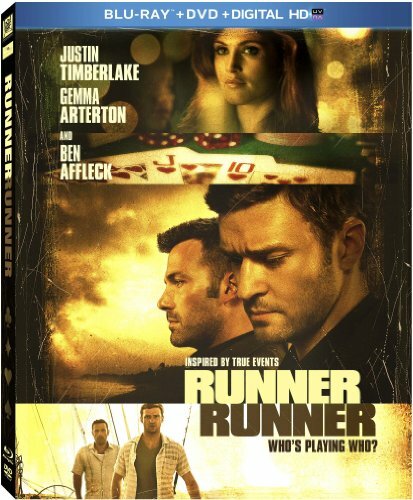 Runner Runner , starring Justin Timberlake and Ben Affleck, will be available on Blu-ray and DVD this coming Tuesday, JANUARY 7th. The title is available now in Digital HD. Justin Timberlake and Ben Affleck star in this high-stakes crime thriller where the lure of easy money is the riskiest bet of all. When Princeton grad student Richie Furst (Timberlake) believes he's been swindled by an online poker site, he heads to Costa Rica to confront gambling tycoon Ivan Block (Affleck), the man he thinks is responsible. But Richie will soon face the ultimate power play as he finds himself caught between Block's promises of unlimited wealth and the zealous FBI agent (Anthony Mackie) trying to bring him down.